HOW DO GEESE LIVE SO PEACEFULLY TOGETHER? CLICK HERE TO SEE ANSWER! 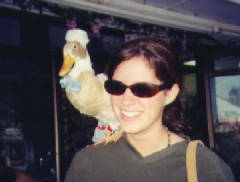 If you had a duck as kid, have found a duck, rescued a duck, plan to get a duck or just like to visit the ducks in the park, you should know that you can diaper a duck/goose (even a chicken, turkey or peacock)! Then you can go walking with it, sleep with it, travel with it, watch TV with it, play with it, and feel it give you a warm, soft hug! They are the cleanest, most loving, loyal, amusing, and beautiful companions you could ever have. But, before you try to raise one, please learn how to understand it and care for it. You'll find emergency and baby care here on this web site, but for long term care you will want to read Nancy Townsend's book, "Duck! There's a Goose in the House!" It won't tell you how to pluck a duck, but it will tell you how to love a duck! For more info, Go Shopping. SEE EVERYTHING YOU NEED TO CARE FOR YOUR DUCK OR GOOSE ON THE GO SHOPPING PAGE! Avian Fashions, the famous makers of the revolutionary bird diaper, the FlightSuit and The Goose's Mother, inventor of the diaper harness for waterfowl, mated a long time ago. We work together in an effort to make diapering downy bottoms a ducky experience! All products on this web site may be purchased on line with credit card or PayPal through Avian Fashions. 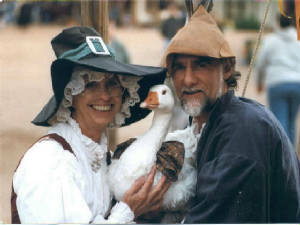 Mother and Father Goose have performed at major renaissance festivals across the country, appeared on "The Tonight Show", VH-l's "Totally Obsessed", and on an HGTV show "Offbeat America". 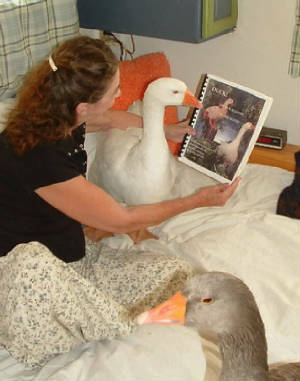 Her book has been heartily approved by several leading veterinarians, and the number of pet duck/goose owners is growing by leaps and bounds. On this site you will also be able to purchase duck, goose, and, yes, even chicken and turkey diaper harnesses, outfits and other ducky accessories, find schedules and pics of Mother & Father Goose at the Renaissance Festivals, see pics of their TV appearances, enjoy many pics of our "kids" as well as those of other duck/goose Mom's & Dads,and learn many interesting facts about these wonderful waterfowl. Geese are very affectionate and most ducks are too! If you have an emergency question concerning a duck or goose, please call me anytime at 520 631-3320!